iPhone is popular for its superior camera and most of the people use it to capture memorable moments. It allows you to take pictures using multiple modes for enhancing their quality. But the photos that you take from your iPhone can be lost because of various reasons like virus attack, formatting error, and accidental deletion, damaged, lost or stolen iPhone and much more. Most of the users have also complained that they lost the photos from iPhone. When this happens, they immediately search the internet - how to recover deleted photos from iPhone free. You don’t have to panic because there are various methods with which you can recover the deleted iPhone photos for free. The photos that you delete accidentally or manually get stored in the “Recently Deleted” album of the Photos app of iPhone. But you can recover the photos only if you have deleted them up to 30 days ago. You can follow the steps below if you are searching how to recover deleted photos from iPhone free. Step 1. Open Photos app in your iPhone and tap on “Recently Deleted” album. Step 2. Tap Select in the next screen and select the photos that you need to recover. Step 3. Tap “Recover” that is in the bottom right to recover the photos to your iPhone. If you don’t find the photos that you need in “Recently Deleted” album of the Photos app, you can either recover using iTunes or iCloud backup. Apple lets you back up the entire data of your iPhone to the computer using iTunes software. You can then restore the appropriate backup to iPhone. Just follow the steps below to recover deleted photos for free. Step 1. Open iTunes on your computer and connect your iPhone using a USB cable. Step 1. 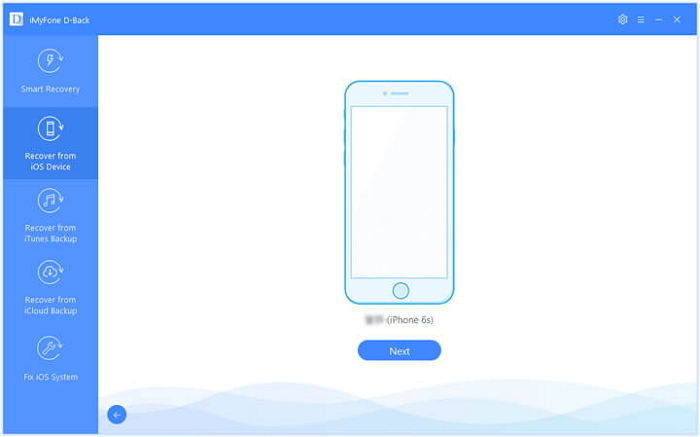 Finish all the steps shown and choose your iPhone for recovering the data. Step 2. Choose Restore Backup for restoring all the data to your iPhone. Step 3. Choose the most relevant backup according to its time and date. Step 4. Once you click on Restore, the system will begin the data recovery process. Step 5. The entire data including the deleted photos will get restored to your iPhone. 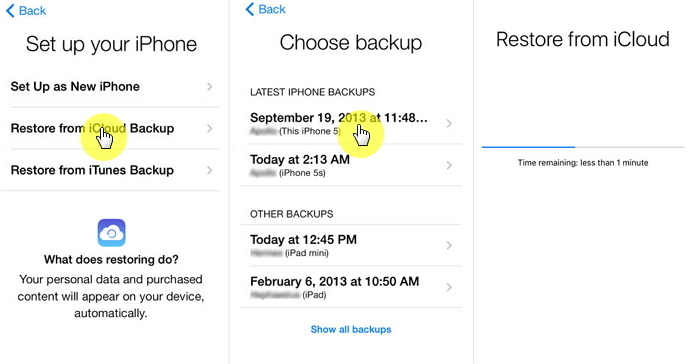 Apple allows you to back up the entire data of your iPhone to the Cloud. Whenever your iPhone gets connected to a Wi-Fi network, all the data will automatically get backed up to the iCloud. With an active connection, you can easily restore the backup to iPhone including photos. Step 1. Open Settings on your device and go to “Apps & Data”. Tap on “Restore from iCloud Backup”. Step 2. Sign in to your iCloud account with Apple ID and password. Make sure your device is connected to a Wi-Fi network. Step 3. Select the latest iCloud backup. Once you select, the restoring process will begin. Sign in to your Apple account again to restore any apps and purchases. The entire data including photos will get restored to your device after the process is over. In case you don’t have iTunes or iCloud backup of the data, you can use a third-party data recovery tool. iMyFone D-Back is one of the most popular tools for recovering the deleted or lost photos of your iPhone, including other 18 data types. It is compatible with all iPhone and supports all the iOS versions and iPhone models. 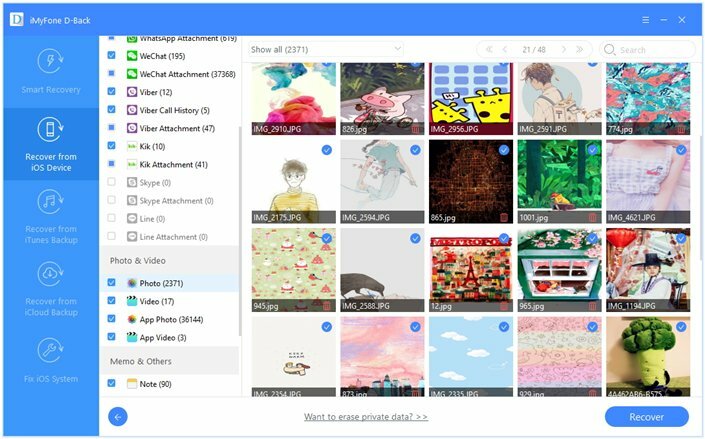 D-Back applies advanced technology to search for the deleted photos in the SQLite database in the most thorough way, which makes it the best photo recovery tool with the highest recovery rate in the market. It supports to recover photos without backup. It supports to view the photos within iPhone backups which cannot be done with iTunes and iCloud. Viewing all the content of iTunes or iCloud backups before recovering or restoring means you will not restore a wrong backup with unnecessary data. Extract and recover photos you need from iTunes or iCloud without having to restore the whole backup which will replace all the current data on device. 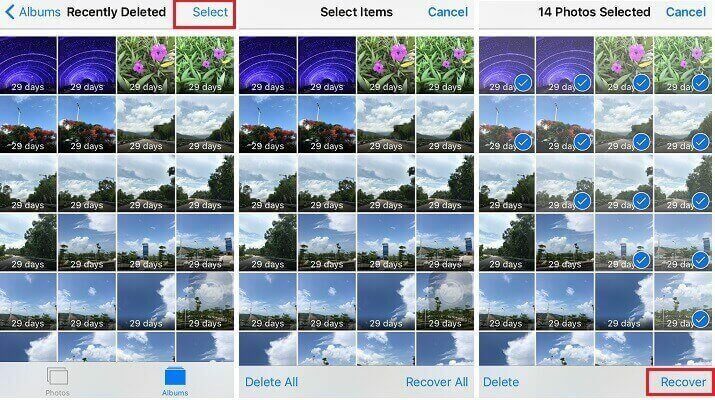 Here are the steps to recover deleted iPhone photos without backup. Before starting, just download the free trial version to check your deleted photos. Step 1.Launch iMyFone D-Back software on your computer and click on “Recover from iOS Device”. Click “Start”. Connect your iPhone to the computer using a USB cable. Click “Next” when the software automatically detects your device. Step 2.Various file types will be displayed. Select “Photo” under “Photo & Video” from various options shown and click “Scan”. Step 3.All the photos will be shown when the scan gets completed. Select the photos that you want to recover and Click “Recover”. Select or create a new folder to store the recovered photos. All the above methods are effective in recovering the deleted photos of your iPhone for free. 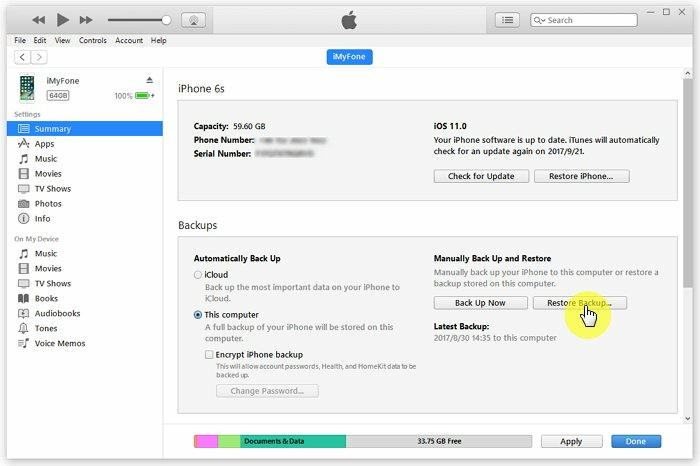 If you have created a backup using iTunes or iCloud, you can easily restore the backup to your iPhone to get all the data including the deleted photos. However, you need to restore all the data for recovering the deleted photos. Meanwhile, the current data on the device will be replaced all. What if you don’t have a backup? You can use iMyFone D-Back to recover the deleted photos of your iPhone without any backup. 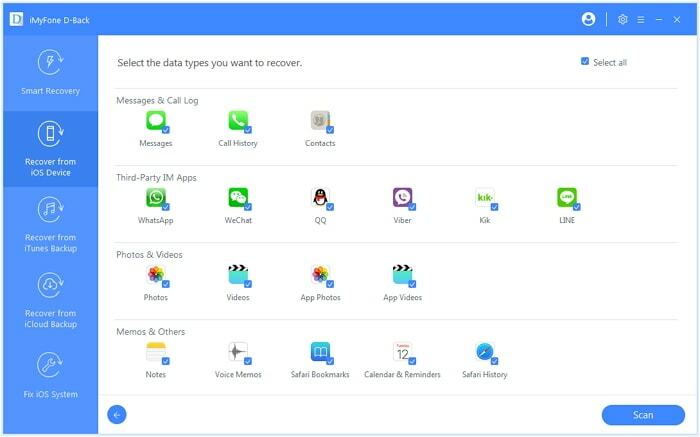 It provides multiple modes to recover the lost data, regardless of how you lost them. You also don’t have to restore the entire data of your device to recover the deleted photos. You can select the photos individually from iTunes and iCloud backups. iMyFone D-Back has helped millions of users across the world in retrieving the lost or deleted data of iPhone. It is trusted by numerous official websites and users for safely recovering the deleted data. If you are still searching - how to recover deleted photos from iPhone free, you cannot miss the methods given above. All the methods will securely recover the iPhone data, no matter how you lost them. Check the reviews of all methods and then choose a method for data recovery. Kindly leave comments below if you have any other method for this.